Say hello to some Flipping Dolphin fun! 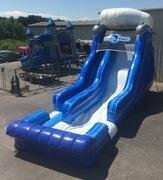 You and your guests will have a blast sliding down the Flipper Dipper Inflatable Slide. Two friendly dolphins sit atop of the slide are ready to ride a wave with your guests. The dolphin-themed slide features a large white wave at the top, two smiling dolphins and a large blue wave at the bottom. This water slide also features a Splash down pool, which holds some water but not like our 2 ft deep pools on our other slides.